Most of the times, being the third biggest club in your city is not a great source of joy and pride, but Beşiktaş (pronounced “beshiktash”) are one of the few exceptions to this universal unwritten rule. They may have less titles, a smaller stadium and a smaller fan base than their two huge city rivals, Galatasaray and Fenerbahçe, but no matter what, they are a true football megapower in Turkey, having earned respect at international level as well. The Istanbul Football League 1923–1924 champions. Beşiktaş Jimnastik Kulübü (Gymnastics Club; so it is in fact incorrect to refer to this club as Besiktas FC in English), were founded in 1903 in the homonymous neighbourhood of Istanbul's European part, which makes them the oldest of the city's “Big Three”. 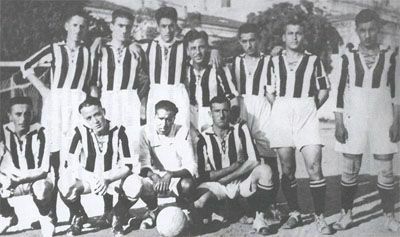 At the Kara Kartallar, “Black Eagles”, they claim to have won the champion's title in 1957 and 1958 as well. Those two seasons, the “Turkish Federation Cup” was organized in the country, and both years it was Beşiktaş indeed who won the title. In 2002, the Federation put a final end to the “dispute” regarding how many Championship titles Beşiktaş really have, choosing the... middle solution, so as to keep everyone happy. The “Federation Cup” was not acknowledged officially as the predecessor of the Turkish national Championship, but, they did accept those two titles as valid in the country's star system, according to which every club can add a golden star to their emblem for every five Championship titles won. The ruling of the Federation was half a victory for Beşiktaş, but a victory nonetheless. Excluding the seventies, during which Beşiktaş had a very “quiet”, titles-wise, decade, the club have been lifting trophies on a regular basis. Their “top highlight” period was between 1989 and 1995 when they won either the Championship or the Cup (in 1990's case both) every season (excluding 1992–93). Their triumph in the Turkish top flight in the 1991-92 season was the most impressive of all, since, for the first time in the country's history, a club won the Championship title finishing the season unbeaten. At international level, Beşiktaş reached the quarterfinals of the European Cup (today's Champions League) in 1987, but this success of theirs was not really as big as it seems, since they only beat one opponent in that edition of the competition, and won just two matches, against Albanian side Dinamo Tirana, in the first round. For reasons that had nothing to do with football, Cypriot side APOEL did not play against the Turks in the second round, with Beşiktaş qualifying without shedding a drop of sweat. In the quarterfinals, still Soviet (before Ukraine's independence) Dynamo Kyiv beat Istanbul's Black and Whites by a total score of 7-0 in the two games between them. The biggest real success of Beşiktaş in a UEFA competition came in 2002-03, when they reached the quarterfinals of the UEFA Cup (today's Europa League). After eliminating Sarajevo, Deportivo Alavés, Dynamo Kyiv and Slavia Prague, the Turkish side met Lazio in the last-8, losing both games, and having their dream to progress further in the competition terminated. In the club's history of over 110 years, the player who has had the honour and privilege to wear their jersey more times than anyone else is Rıza Çalımbay, a winger just 1.65 tall, who spent his entire career at Beşiktaş, from 1980 to 1996. Hakkı Yeten, a striker practically unknown outside of Turkey, netted an incredible 382 goals in 439 matches between 1931 and 1948, in times when football was incredibly different to today's. Feyyaz Uçar, another formidable striker of a much more modern era, scored 184 goals for Beşiktaş between 1982 and 1994, being a key figure in the team that won three successive Championship titles from 1990 to 1992. One of the entrances of the old BJK İnönü Stadium. Beşiktaş happily entered their brand new stadium in 2016, a major upgrade to their old BJK İnönü Stadium. The Vodafone Arena is situated exactly at the same place, less than 300 meters from the famous Dolmabahçe Palace on the European side of Istanbul. 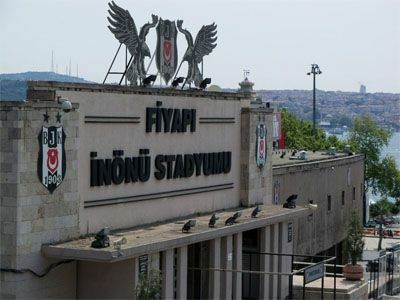 The old stadium was named after Turkey's second president İsmet İnönü, an avid Beşiktaş fan. His name was given to the stadium in 1973, soon after his death. Beşiktaş celebrated their first months in the new stadium winning the Championship title, their first since 2009, signaling the start of a new glorious era for the club. BJK are the initials of the club, 1903 is the founding year, and a small version of the Turkish flag is situated at the heart of the emblem. According to the star system of the Turkish Football Federation, Beşiktaş can have two golden stars on their logo, corresponding to their 12+2 Championship titles won. The club have chosen to have those two stars in black on their jerseys, so as to be in harmony with their predominantly black and white crest.